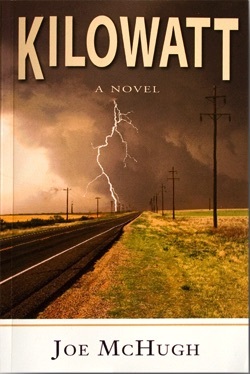 Set during the final years of the Bush adminsration, Kilowatt tells the story of Reb Morgan and Alice Carpenter, journalists from a small community radio station in the mountains of northern California, who embark upon a perilous journey into the very heart of corporate America. EnerTex, a Texas-based energy company with close ties to the White House, claims to have discovered a revolutionary process for generating electricity that is both environmentally “clean” and affordable. But they refuse to reveal the details of this new technology under the pretense that to do so would threaten national security. Has EnerTex successfully found a way to address the world’s pressing energy needs and avoid global warming? Or have they, instead, opened a veritable Pandora’s box that could endanger the future beyond imagining? As Reb and Alice pursue their investigation, they encounter a brilliant but troubled physicist, a former colonel with Soviet Special Forces, a Texas oil man, an ambitious “deal originator,” a populist radio commentator, a high-level GOP “fixer,” the director of an energy watchdog group, a ruthless gang of Russian mobsters, and Avery Jordan Axton, the enigmatic president and CEO of EnerTex. "This book is great, easy reading, being rather difficult to put down. Once I entered into the depth of the pages, I was hooked. Kilowatt will take your mind off whatever you are stressed over right now, yet it will also cause you to pause and think...is this for real?...it could be. Who's going to tell you if it is or is not real other than Joe McHugh and people like him? Stimulate your mind: buy and read this book."